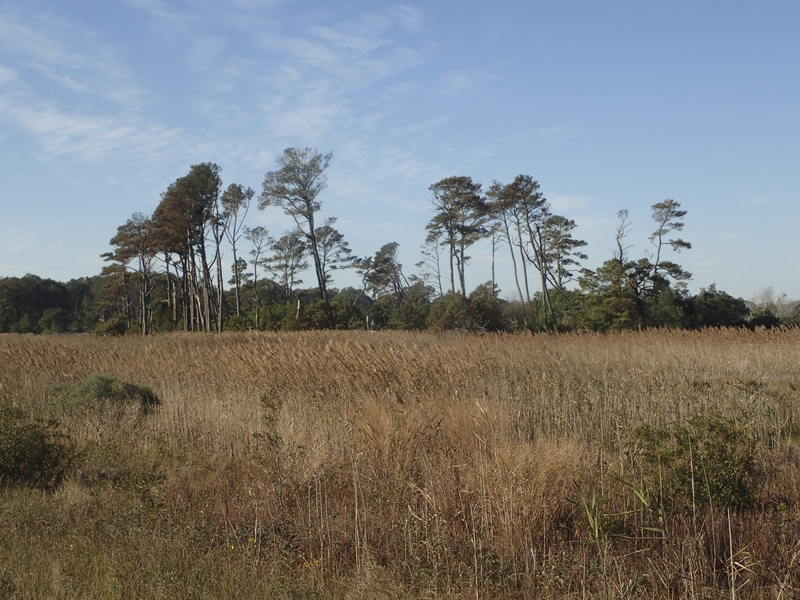 I had some time to explore over the recent holiday weekend, but decided that my favorite place, Pungo, would probably be too crowded so I thought I should try someplace else. My original plan was to head to Florida, but, with some chores that needed attention on Friday, and uncertain weather forecasts, I opted for a closer destination. 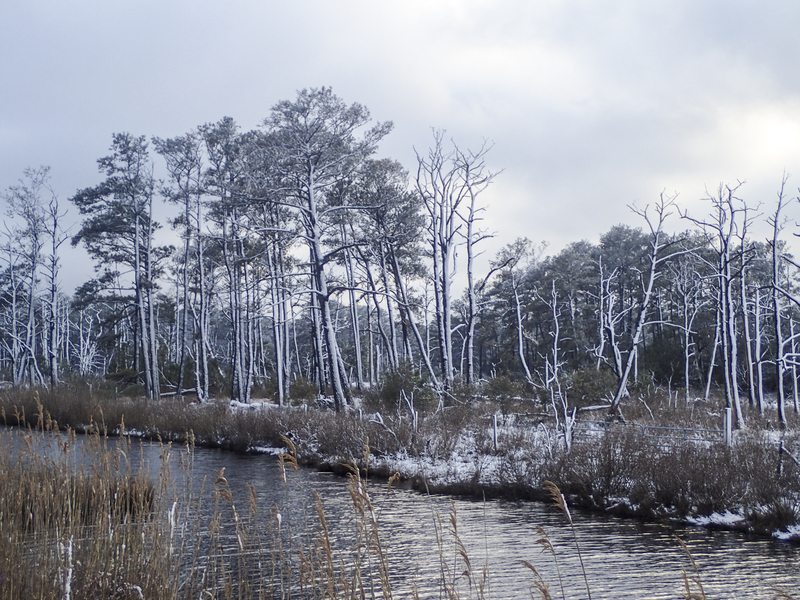 I headed north on Saturday to Chincoteague National Wildlife Refuge on the Eastern Shore of Virginia. 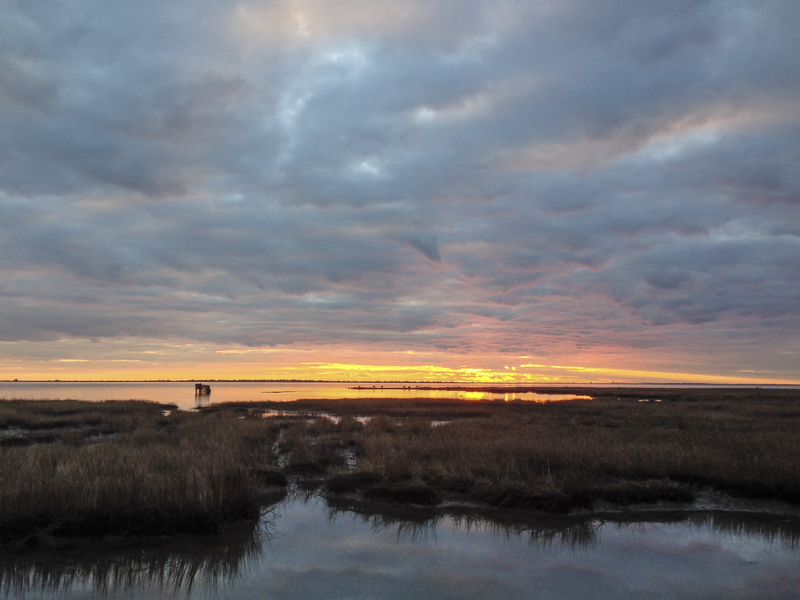 Established in 1943, the refuge totals over 14,000 acres of ocean-side habitats including beach, dune fields, marsh, and maritime forest. I arrived just in time to drive out onto the Wildlife Loop (it opens at 3 pm to cars; you can hike or bicycle earlier in the day), which has produced some nice sightings on previous trips. The trail was packed with people, but relatively few birds. 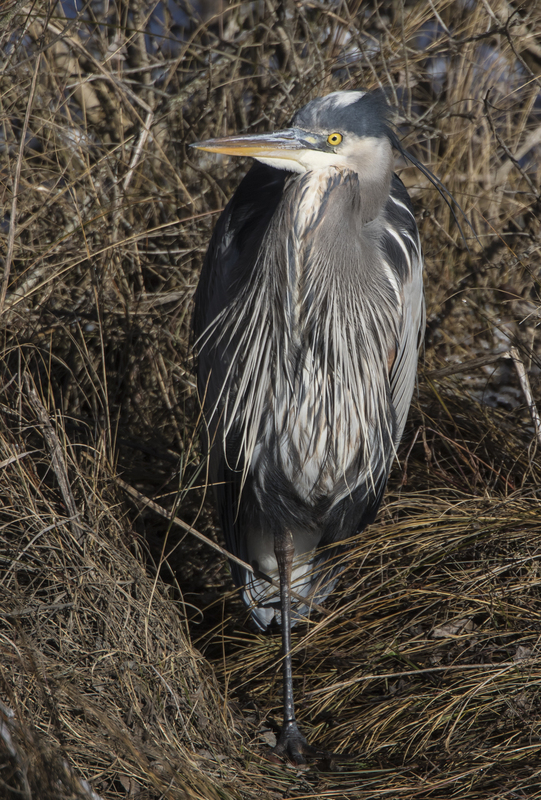 I saw a handful of ducks, an eagle, and a couple of herons and egrets. The sky and afternoon light were beautiful, but clouds were quickly moving in, and the forecast had changed to an increased chance of precipitation overnight and the next day. The cloud cover thickened as I drove out toward the beach hoping to see some shorebirds or gulls. Along the way, a striking sunset began to color the sky, so I stopped to watch it progress. 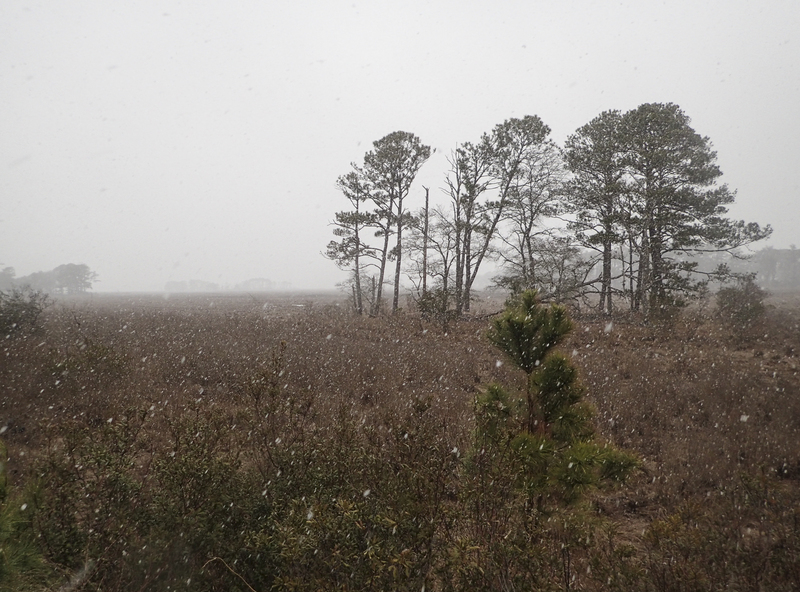 I spotted something out on a sliver of land (to the right of the duck blind in the photo) and when I glassed it, saw that there was a small herd of the famous Chincoteague wild ponies grazing in the marsh. I must admit, I usually don’t take many photos of wild horses, but I couldn’t help myself as the sunset grew in intensity. I got out the 500mm with a teleconverter and took a series of shots as the horizon burst into flames of orange and red. Anytime there is a pony within sight on the refuge, crowds begin to gather, and the road was soon lined with cars enjoying a spectacular end to the day. The next morning was just gray and cold. So much for the old “red sky at night, sailor’s delight” theory. By 9 a.m. a very wet snow was falling. The changed forecast called for snow all day and then bitter cold and strong winds. Florida was looking like a better choice, perhaps. But, I decided to make the best of it. I geared up and hiked the 1.6 mile Woodland Trail, hoping to find a Screech Owl or some other wildlife holed up in one of the many cavities in the dead pines (a pine beetle outbreak has killed large numbers of pines on the refuge). Since the snow had intensified, I just carried my point-and-shoot and binoculars. 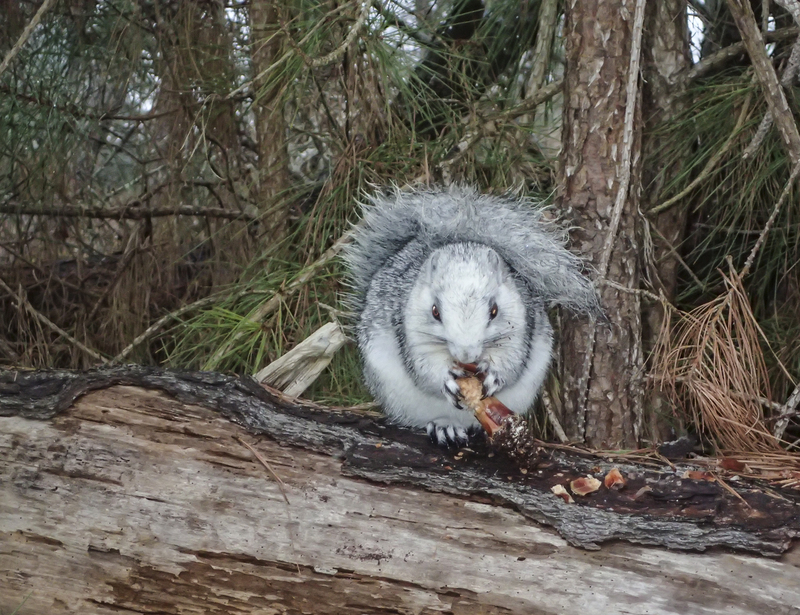 Of course, with my good camera in the car, I came across a very cooperative (and wet) Delmarva Fox Squirrel chewing on a pine cone. These beautiful squirrels have just recently been taken off the Endangered Species List. They are huge, weighing up to 3 pounds, making them roughly three times the size of your typical backyard Gray Squirrel. I soon started feeling about as wet as the squirrel, so I headed back to the hotel to dry out and do a little writing. The snow continued all day, but eased up late in the afternoon. I soon headed back to the Wildlife Loop, hoping the bad weather might have created some wildlife opportunities. There were few birds (and now almost no people) until I got almost all the way around the 3.5 mile loop. 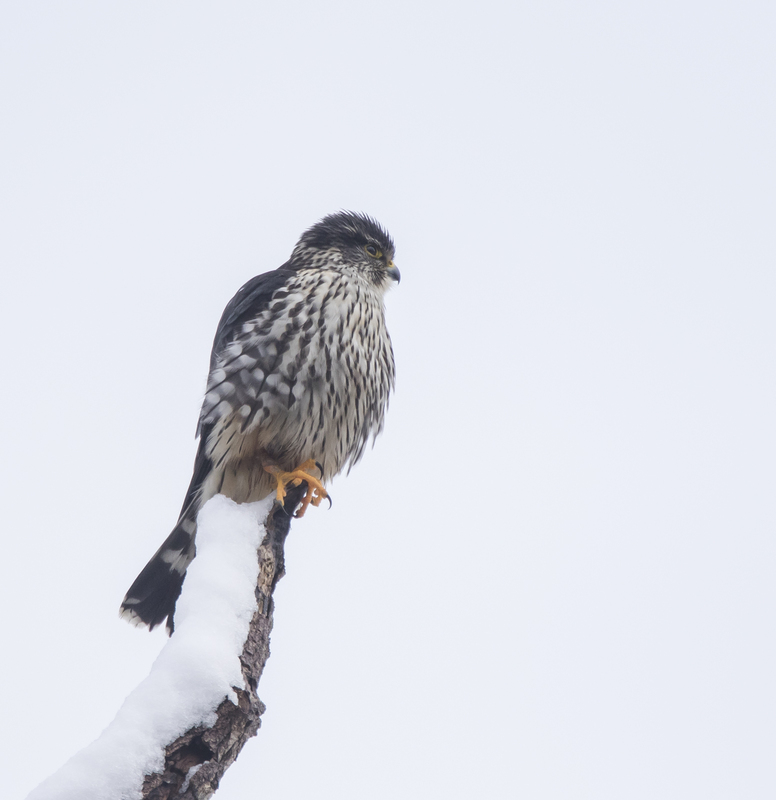 A lone snag at the edge of the marsh had a nice surprise perched up on a high branch – a Merlin. 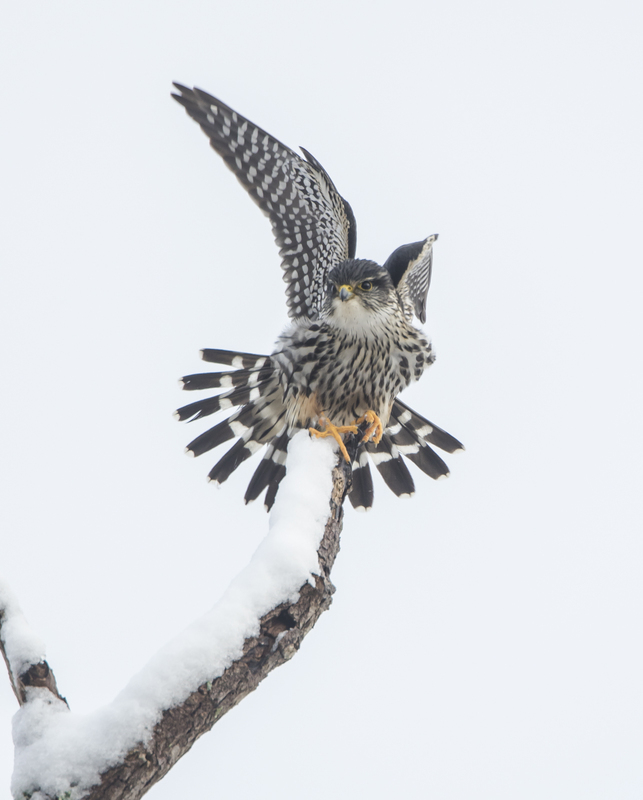 This has been a good winter for Merlin sightings and this pugnacious little falcon was very cooperative. I sat with it for 15 minutes until another person came along and spooked it. But it gave me a lot of poses as it apparently was stretching and trying to dry out its feathers. Darkness came quickly with light snow still falling. The next morning was clearing, but bitterly cold, with temperatures in the teens and a strong northerly wind. The winds had painted one side of the trees white with the remaining snowfall overnight, but few people were out to enjoy the scene as I patrolled the refuge roads. 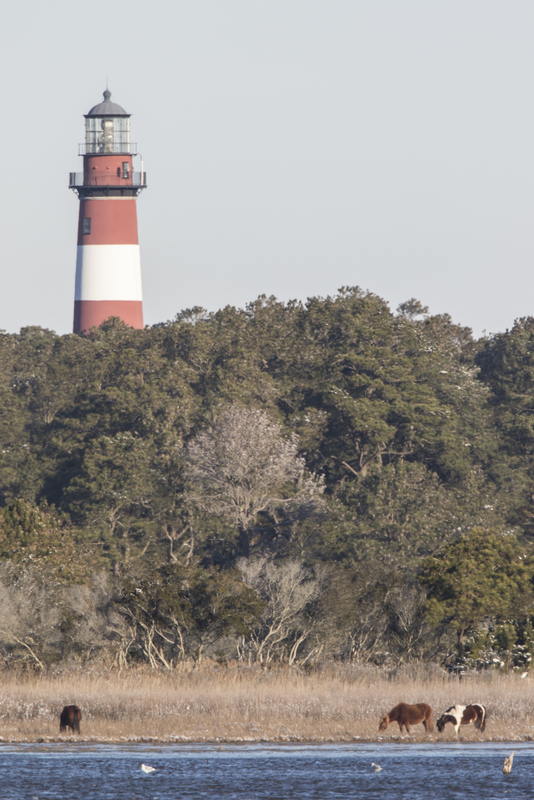 I was the only one seeing the horses as they now grazed the marsh near the historic Assateague Lighthouse, completed in 1867. It seemed as though all the wildlife was hungry and active in the cold. 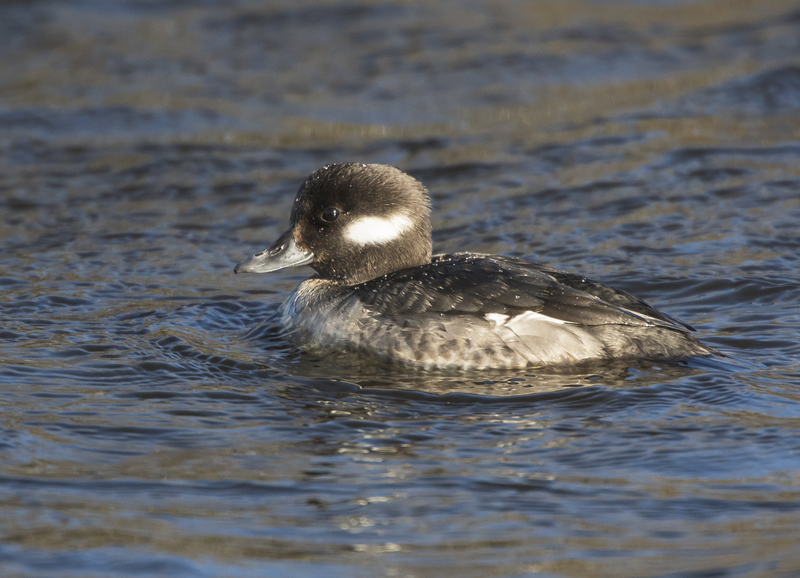 The overnight drop in temperatures froze some of the shallow pools and brought birds to the deeper channels close to the road, providing me with a better look than the previous two days. 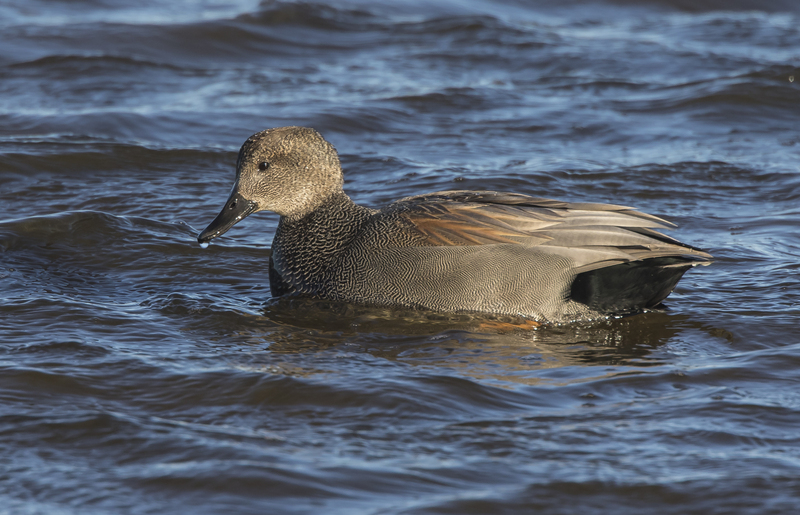 The morning turned out to be productive, in terms of good bird sightings, and the light was just right to highlight some of the details of the ducks. I still had another day to search for critters. Bombay Hook perhaps? While there were reportedly some good numbers of Snow Geese up there, it was another 3 hours north. Its soaring flight, with its pure white head and tail glistening in the sunlight, is really inspiring; and it adds grandeur to the scene as it sits in a dignified pose on some dead tree, its white head clearly visible against the dark green of the forest background. Interestingly, the famed ornithologist quoted above also had this to say abut our national bird…“On June 20, 1782, our forefathers adopted as our national emblem the bald eagle, or the “American eagle” as it was called, a fine looking bird, but one hardly worthy of the distinction. Its carrion-feeding habits, its timid and cowardly behavior, and its predatory attacks on the smaller and weaker osprey hardly inspire respect and certainly do not exemplify the best in American character.” He also was not in favor of Benjamin Franklin’s preference for the Wild Turkey as our national symbol saying “such a vain and pompous fowl would have been a worse choice.” A Golden Eagle would have satisfied him, being a “far nobler bird”, but, as it is not strictly American, it would not qualify. So, in spite of its perceived character failings, Bent conceded that the Bald Eagle is at least a majestic looking bird. I agree, majestic, indeed. 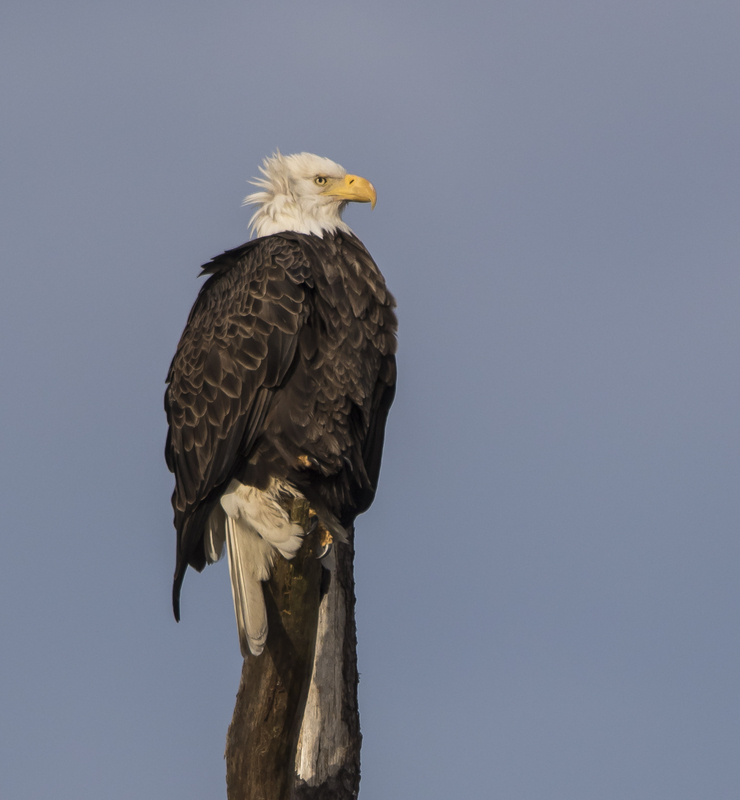 And, in spite of the scarcity of waterfowl on my recent circuit through the wildlife refuges of nearby states, I was greeted at every one of them by at least one Bald Eagle, Haliaeetus leucocephalus. 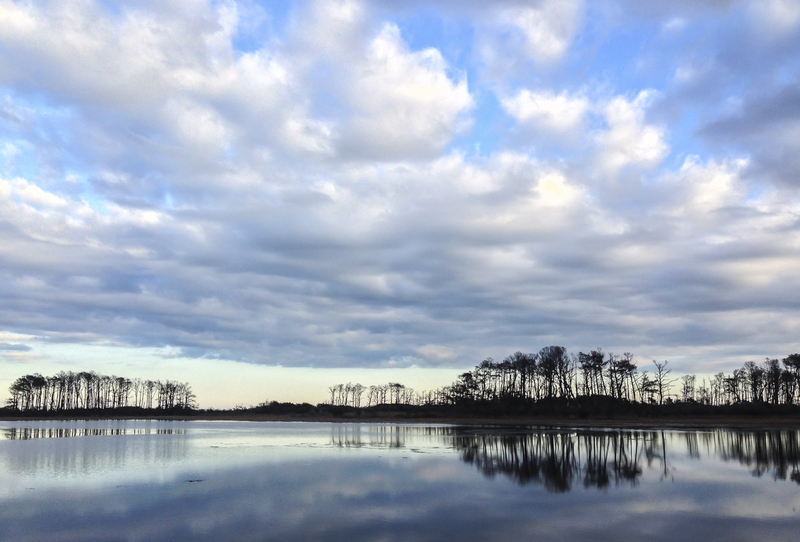 The best views were at Chincoteague National Wildlife Refuge in Virginia. On my last trip there, two years ago, I saw eagles near their nest site in a small grove of trees adjacent to the Wildlife Loop on the refuge. The nest is apparently still being used. Two adult birds were sitting in it, barely visible if you didn’t know where to look. The huge stick nest sits in a large pine less than 100 yards from a popular trail and is easily visible by the thousands of visitors that walk, cycle, and drive (cars are allowed on the loop after 3 p.m.) the loop each year. The refuge also has an eagle cam in their visitor center which provides lots of information and updates on the status of the nest. I believe this nest has been in use since 2012, when the previous one fell during the winds of Hurricane Sandy. 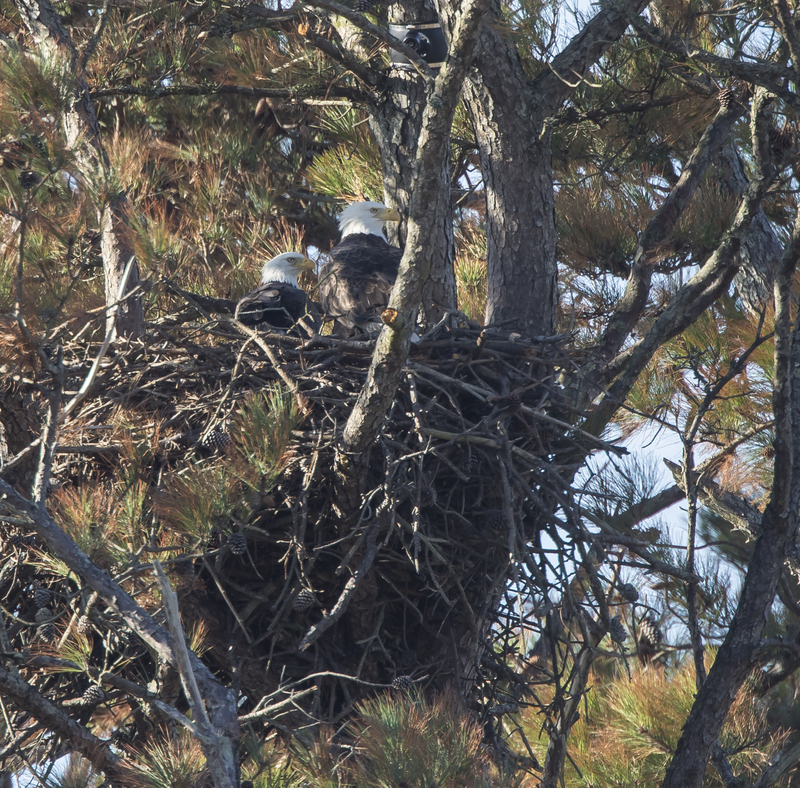 Eagle nests tend to be used year after year, with more material added each year. This can lead to huge nests over time. 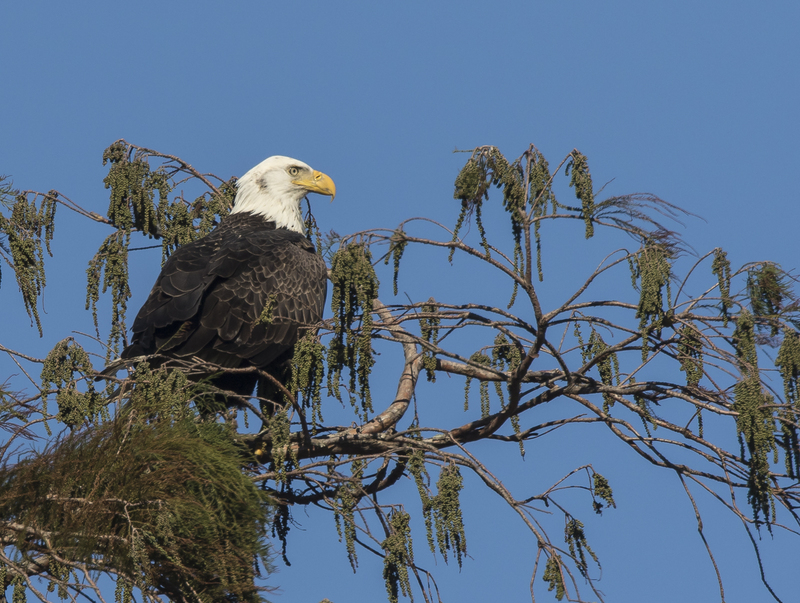 A typical Bald Eagle nest is 4 to 5 feet in diameter and 2 to 4 feet deep. The largest Bald Eagle nest on record, located in St. Petersburg, Florida, was 9.5 feet in diameter, 20 feet deep and weighed almost 3 tons. That nest holds the record as the largest nest in the world built by a single pair of birds. 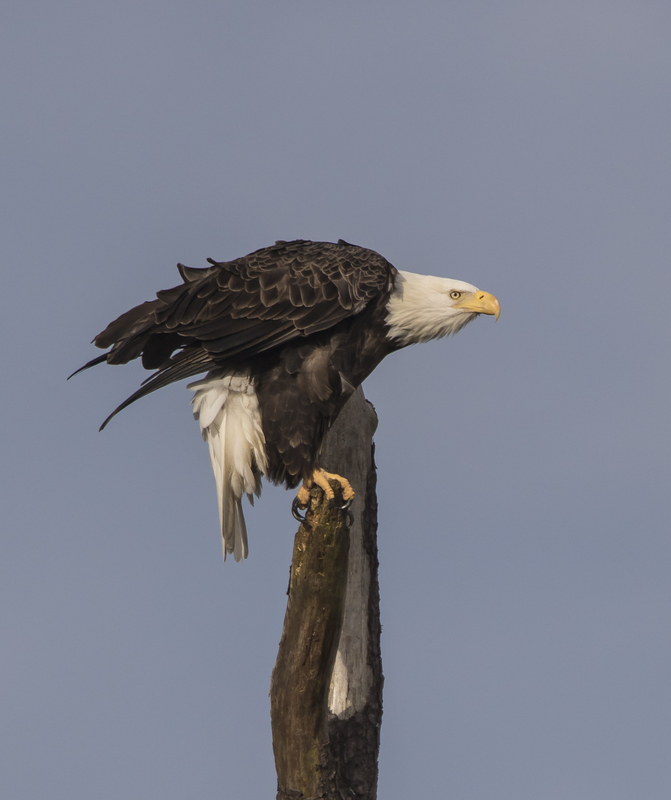 On my second morning at Chincoteague, I was rewarded with one of the eagles perched out in the open near the nest. 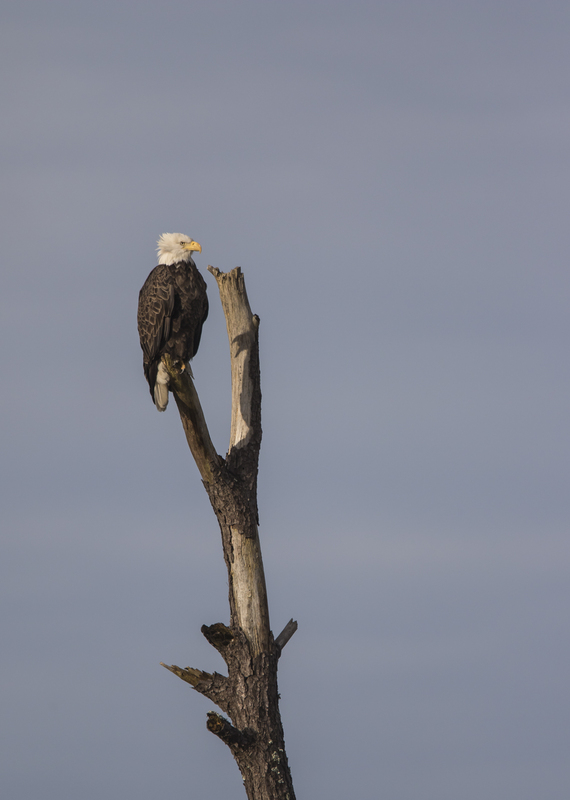 It was a classic perch, a tall, lone dead pine, a perfect place to survey your world if you are an eagle. 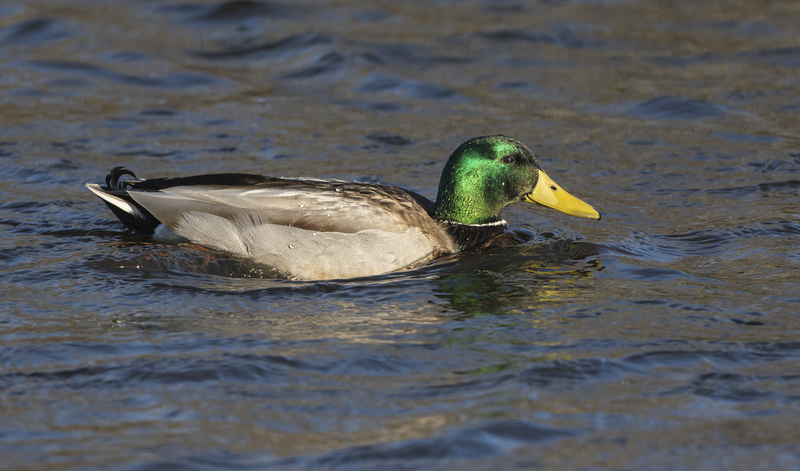 I set up my tripod, put on the 500mm with a 1.4 teleconverter, and shot way too many shots as the eagle watched the comings and goings of ducks, ibis, and various other birds. At one point, the eagle leaned forward and stretched out. I thought it might launch itself into the air, a shot I would love to capture. But, it was merely to get at an itch. The eagle leaned back and brought up its formidable talons to delicately scratch its face. 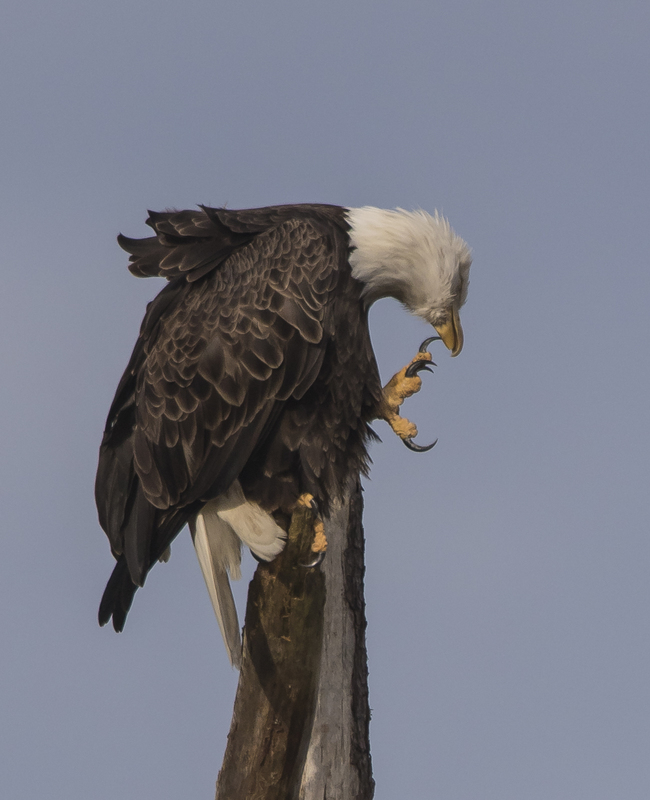 The talons can be used for a delicate operation like preening feathers, or for killing the eagle’s prey. According to the web site of the National Eagle Center, the crushing strength of each talon is estimated to be at least 400 pounds per square inch (psi). That is at least ten times stronger than the average grip strength of between 20 to 40 psi for a human hand. The talons on a female eagle are longer than those on a male (females are larger in general). The hind toe (hallux) has the longest talon and may be almost two inches long on a large female. 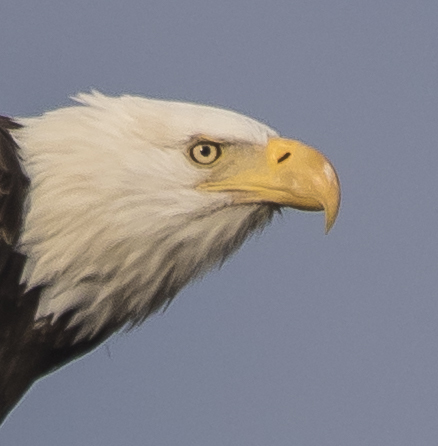 Another notable feature of a perched Bald Eagle is its impressive beak. Like the talons, the beak is made of keratin (similar to our fingernails). And its hooked tip and large size relative to the head size is an identifying feature for eagles even in poor light or at great distances (relative to vultures and some other large birds that people might confuse with eagles). Of course, the eyes of an eagle are one of its most impressive features. They are almost the same size (weight) as a human eye, even though an adult eagle might weigh only 14 pounds. Obviously, an eagle’s eyes take up a large proportion of its skull compared to ours. No one knows exactly how much better an eagle can see than us, but there have been some comparisons. Rod and cone cells on the retina send sight information to the brain. A human eye has about 200,000 cones per millimeter in a concentrated area on the retina. A Bald Eagle has a much higher concentration of about one million cones per millimeter. An online search showed a range of estimate that an eagle has anywhere from 4 to 8 times the visual acuity of a person. 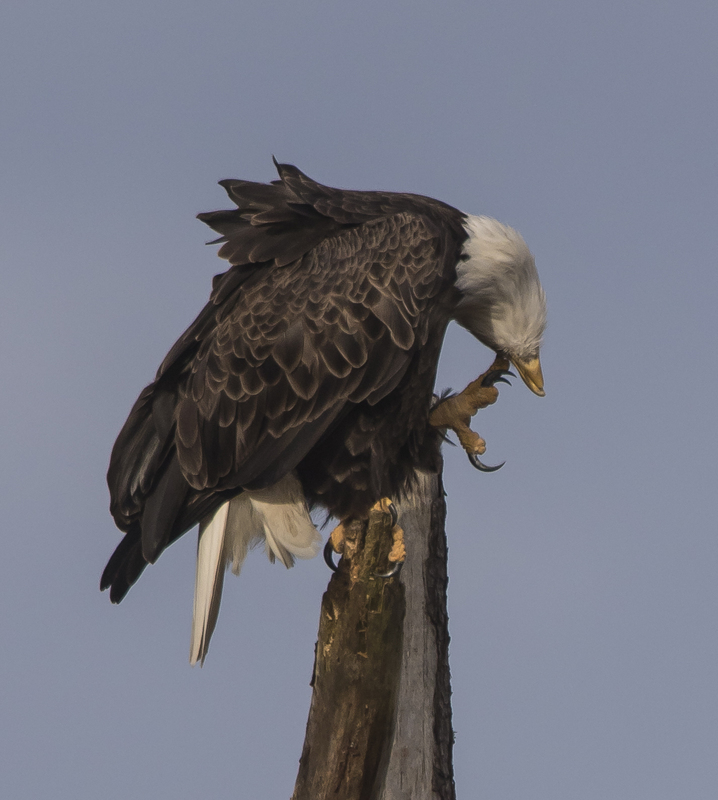 I probably observed over twenty Bald Eagles on this trip, stopping to enjoy each sighting. I guess I must respectfully disagree with Mr. Bent in his assessment of our national bird. 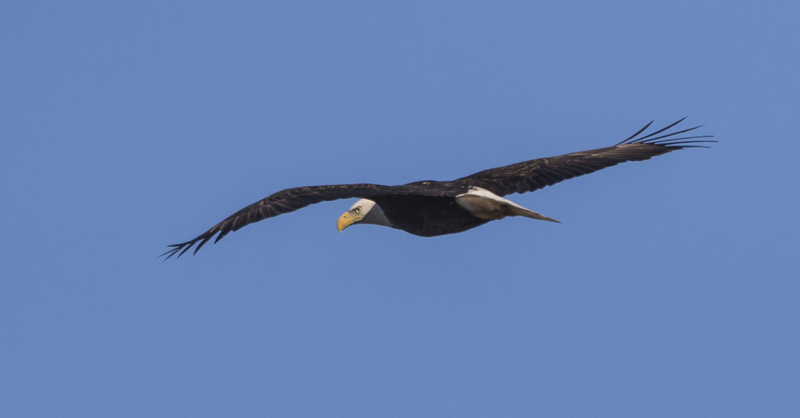 It is always a thrill to see one, and my recent tour of refuges showed that eagles are doing well here in the East. In fact, Bald Eagle populations nationwide have recovered enough that they were officially removed from the endangered species list in 2007. Back in 1963, the all-time low population of Bald Eagles in the lower 48 of the United States was estimated at 487 nesting pairs. When they were delisted, eagle populations had soared to an estimated 9789 nesting pairs in the lower 48. One recent estimate put the total population (not just nesting pairs) of eagles in North America (including Alaska and Canada) at 69,000. They are now being celebrated in many areas with eagle festivals, eagle-watching tours, and eagle nest cams. 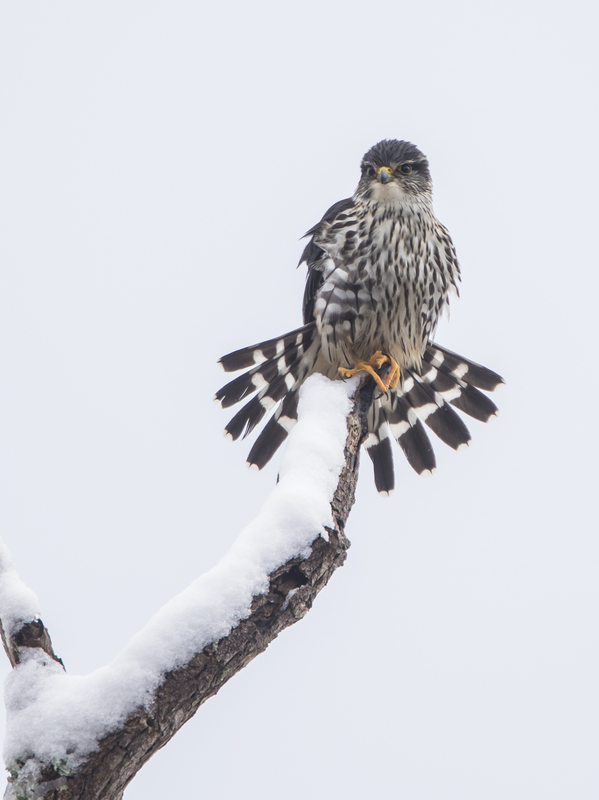 For me, the delight comes from seeing one perched in a tree, looking out over the terrain, searching for prey, and then lifting off with powerful wing beats into a blue sky. I, for one, am glad they are back. I wake up in he morning and I say Ahh! Today’s the day for a song! 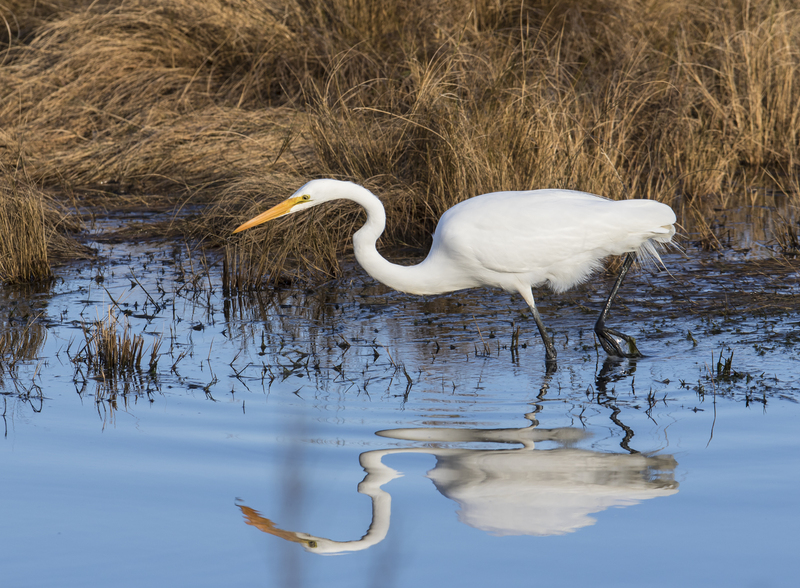 I went on a rambling road trip last week to search for some migrating waterfowl and shoot a few images of something other than the weird bugs and fungi I have photographed recently (not that there’s anything wrong with that:) I started my quest at Chincoteague National Wildlife Refuge in Virginia. I drove out next to the beach at sunset and found several gulls resting in the late afternoon sunshine. One immature gull was perched on a sign post next to the parking lot. As I pulled up, the bird gave me the… well, an apparent opinion on my presence, or was it? It opened its beak wide, closed it, and repeated. Another car came by and my friend flew off leaving me wondering about this behavior. I have seen it before, especially in gulls…a repeated opening and closing of the beak while seemingly resting on the beach. …another gape. So, is it me? Am I that boring? Is it a yawn? An online search that evening yielded little in terms of an explanation. 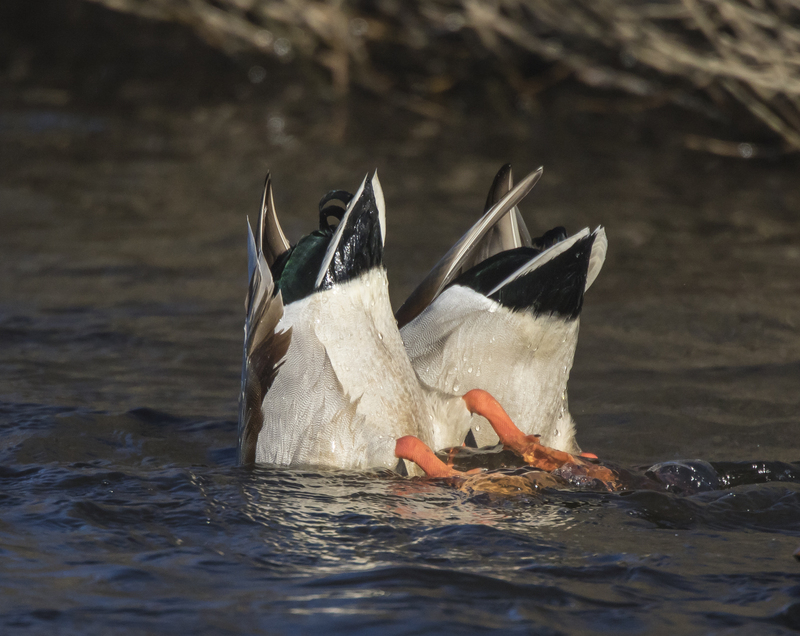 When searching about birds using the term, “gape”, which to me means to open wide, the discussion was instead on the technical term relating to a part of a bird’s anatomy. The gape is the interior of the open mouth of a bird. It is common for the young of many species of birds to have brightly colored gapes which is believed to induce feeding by parent birds. When I googled gulls opening and closing their beak rapidly, I got things like threat displays of some birds, begging for food by young (and, in some species, females that are being wooed by a male), and the possibility of something being stuck in the throat of the bird with mouth ajar. There is even a parasitic nematode that irritates the trachea of an infected bird causing a disease known as “the gapes”. But, it seems like that is more prevalent in young poultry and pheasants. So, I guess I am still unclear as to why the gulls are doing this. The light was fading, and as I started to head back to the hotel I noticed a Royal Tern sitting atop a low dune. As I pulled up…yup, he gave me the gape. Maybe I am overthinking this, and it really is just a sigh of relief, or a yawn, after a long hard day. If I check, they are probably doing the same thing on Monday mornings. I think I remember seeing that in some of my human counterparts back at the museum.